Most Vancouver nightlife and bars are concentrated into five nightlife districts, each with their own unique vibe and appeal, including downtown Vancouver's Granville Street, Gastown, and Yaletown. 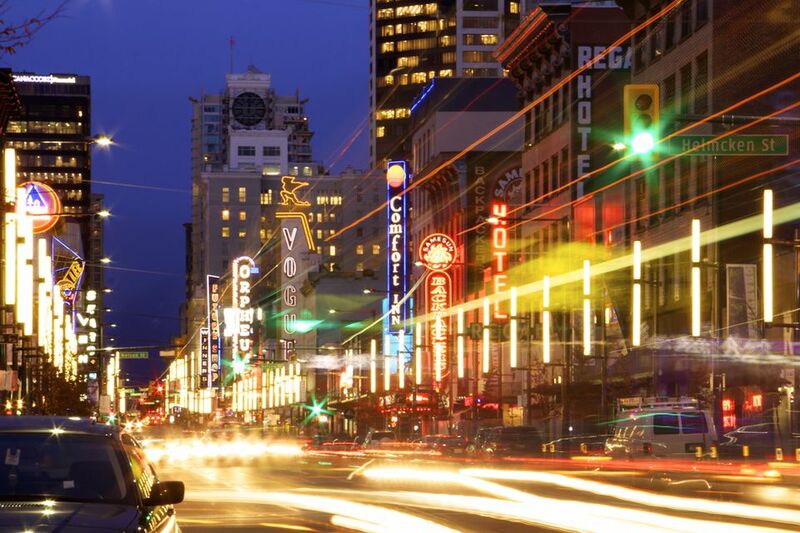 Downtown Vancouver's Granville Street is ground-zero for hard-partying Vancouver nightlife. Stretching, roughly, from Nelson St. to Robson St., this area of Granville Street is packed with bars and nightclubs, making it easy to club-hop from one destination to another. Home to several of Vancouver's top 10 nightclubs--including The Roxy and The Belmont Bar --Granville Street attracts twenty- and ​early-thirtysomethings looking to drink, mingle, dance, and show off their party clothes. Weekends are busy on Granville Street: Be prepared for entrance lines at the hottest clubs. High-tech yuppies, pretty young things, and a fair number of celebrities (Vancouver is Hollywood North, after all) populate the most stylish Vancouver nightlife district: Yaletown, on Hamilton Street and Mainland Street. Yaletown's nightlife is ultra-trendy, epitomized by the celebrity hotspot OPUS Bar (at the Opus Hotel), the always-crowded Bar None and the "Hey, isn't that a Canucks player?" Glowbal. If you want to dress up, sip pricey cocktails and see-and-be-seen, this is the Vancouver nightlife district for you! When it comes to Vancouver nightlife, no district is as diverse as the always-evolving Gastown. Vancouver's historic center, Gastown's nightlife runs the gamut from casual, local pubs like the Irish Heather to the sophisticated, urban-chic cocktail spots at L'Abattoir and The Diamond. Crowds in Gastown are diverse, too. Cocktail bars and pubs attract all ages, while dance clubs like The Lamplighter and The Blarney Stone skew younger. When it comes to gay Vancouver nightlife, Davie Street in downtown Vancouver is the place to be. Packed with clubs, bars, and restaurants, Davie Street is home to Vancouver's most popular gay club, Celebrities. For live music, check out The Main, Cottage Bistro and The Biltmore.